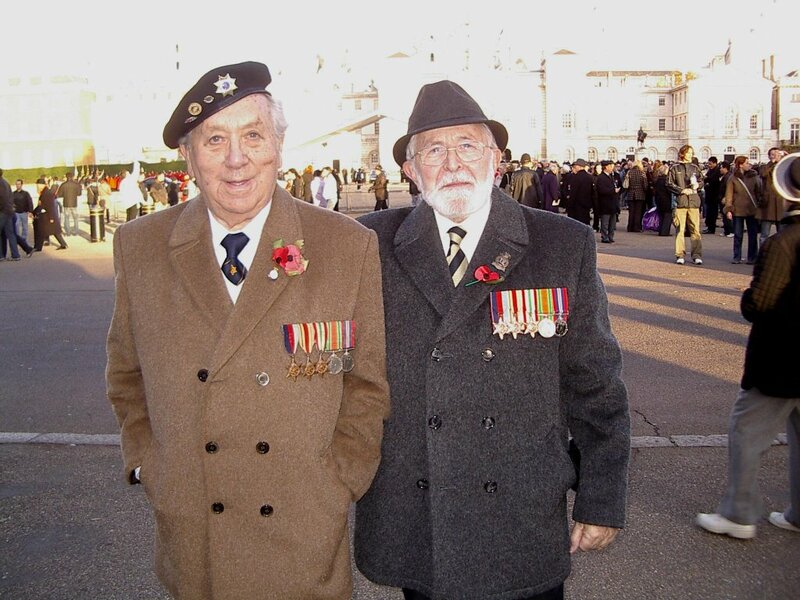 I've added a link to AJEX (Association of Jewish Ex-Servicemen and Women). Starts with photographs of the 2006 Commemoration Parade. I've added an excellent RAF link, sent by Paul O'Neill. It's a good addition to our growing links. Dressing up, or dressing down? A few days ago I read an article in the newspapers that there was a 'furore' caused by a former serviceman who had dressed up as Adolph Hitler at an event intended to raise money for the charity 'Children In Need'. The article I read reported Mr Robbie Robinson, a former serviceman currently working for a contractor at HMS Collingwood at Fareham, Hampshire, dressed up in a Nazi-style uniform complete with false moustache and mock Iron Cross. A number of WW2 veterans were reported as saying this was inappropriate, in bad taste, showing a lack of respect for those who died during the war and that it was likely to upset a lot of people. Two years ago Prince Harry received a lot of criticism for turning up at a friend's fancy dress party dressed as a Nazi, which he later admitted was a poor choice of outfit. Last year, one of the local amateur dramatics societies in my home area of West Cumbria were putting on the stage show version of the BBC TV comedy series "Allo Allo". The first set of advertising posters had to be withdrawn after, again, a number of people complained at the posters using swastikas and the Nazi flag. "Allo Allo" and "Dad's Army" have been among my favourite comedy programmes and I went to see this version of "Allo Allo" at the Rosehill Theatre, Moresby, which was actually opened in the late 1940s by a Jewish refugee from the Nazi Occupation of Hungary (Sir Nicholas Seker). Personally, I thought it was an excellent play. Most of the cast seemed to end up attempting to impersonate Adolph Hitler or Herman Goering, and the situations so ridiculous it just had to be funny. Personally I think that, provided it is done tastefully and in the correct way, it is acceptable to laugh at what people did in the war - Adolph Hitler and Herman Goering included. Even during the war years there were actors who dressed up as Adolph Hitler for comedy turns. I seem to remember watching a film in a dance hall where British people gave Nazi salutes while singing and dancing to "We're going to hang out the washing on the Siegfried Line". Surely you had to do something to laugh to counteract the grim reality of what was going on? If it was fine to dress up and laugh during the war years, then doing the same thing must be acceptable today? The problem may be where to draw the line between what is acceptable and what is not. It is a difficult one to judge whether dressing up as a Nazi is acceptable in a particular instance. Thought the members may be interested in his site I stumbled across. It's about somebody's uncle who served with the 2nd Royal Gloucestershire Hussars and 4th Queens Own Hussars during World War 2. Some pics of people who were killed on Coriano Ridge in 1944 which Tom should find interesting to say the least. Click on the photos link for even more photos. Initials as being that of “Rob All My Comrades”. I would beg to differ. When I was wounded on the Coriano Ridge, I was finally picked up by medics of the Seaforth Highlanders of Vancouver and taken to their Regimental Aid Post, which was a fold in the ground with a tarpaulin cover where I was treated for shock by having a cigarette placed between my lips by a sergeant who was unconcerned that I did not smoke at that time. The cigarette helped cool me down until I was taken away on a four stretcher jeep for the long haul to Ancona. Now this Jeep was driven by a member of the Royal Army Service Corps which did a remarkable job in keeping us supplied with food , mail, clothing and various items for our comfort and delivered to our Brigade base camp for supplies from which our own regimental “A” and “B” echelons delivered these items to our Squadron Quartermaster for issue to us at the sharp end, for which we were unusually, most grateful. Getting back to the main thrust of the story however is that during this drive to Ancona, I have no doubt that I fell into a very deep sleep along with my three stretchered comrades plus the walking wounded chap sitting alongside the driver. At some point in this journey – someone felt the need to stop the vehicle and check out the contents of the passengers pockets, as when we finally arrived in the early a.m. at the CCS in Ancona – the only paperwork of any description we had was the inevitable AB64 – I was bare naked in a bed and lying on my stomach. At some point of that day, one of our Achelon drivers had the occasion to relieve himself, at the offside of his vehicle naturally, and spotted an object lying near the ditch. On carefully prodding this object with a stick in case of booby traps – he found it to be a wallet. Not any old wallet but one – according to the photographs inside – no cash – just photographs - which belonged to one Trooper Tom ! On reaching the “A” squadron lines he enquired as to the whereabouts of trooper Tom and was told that he had been wounded and was probably skiving in some hospital somewhere but like the bad penny he will no doubt show up once more. Now instead of consigning this wallet to the Squadron clerk for further treatment – the driver hung on to it – and with the passage of time – forgot all about it. So it was some time later that I found myself in the midst of many ex 145th comrades who had been sent to Rieti for re-training after the Battalion had been disbanded and on finding a bed space, was approached by the Echelon driver who handed me my wallet, apologizing for not sending It to my parents, as he had intended to do. So, I would say that the Myths and Mythunderstandings surrounding the R.A.M.C. Initials should be replaced by the initials of the R.A.S.C. – Rob All Sick Comrades – but I note that they forestalled this by giving them a PC and upscale new Title of Logistics – now what can one do with that ??? Once a year, on the following Sunday after the British Legion Annual Remembrance ceremony, AJEX (association of Jewish Ex-Servicemen & Women) meet at the cenotaph to remember the fallen. There were many wartime stories that I came across whilst I was a volunteer for the "People's War" project that I never got round to posting on the website. The main reason for this was because of insufficient time to write them all up before the closure of the project at the end of January 2006. One of these concerned Lance Corporal T.B. Malkinson MM from Egremont Cumbria who was awarded the Military Medal for an unselfish and courageous action during the assault at Djerba, Tunisia in May 1943. I would like to record my thanks to Mr Ian Cavaghan, Branch Secretary at Egremont British Legion for allowing me to take the above photograph. "On 8th May 1943 "C Company" The Cheshire Regiment took part in the attack on Djerba near Tunis in North Africa. Part of "C Company" was blown up on its way to reorganise when Lieutenant Kerr's Platoon had some vehicles blown up on a mined track. Lance Corporal Malkinson was thrown clear in the explosion. He immediately went to the aid of men who were badly wounded, pulling them clear before they were injured further. He then gave them First Aid until the Medics arrived. This action took place under heavy German Machine Gun Fire. Lance Corporal Malkinson saved the lives of six of his comrades at great risk to himself". 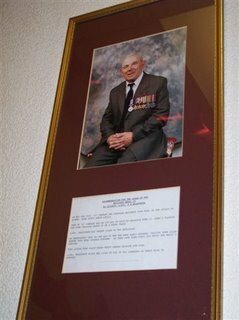 Although Mr Malkinson has passed away his courage is still remembered by the British Legion in his hometown. He was obviously a brave man of unselfish courage. The framed photograph of Lance Corporal Malkinson was made by Mr Mike King of Whitehaven who has also framed the photographs of other Egremont 'local heroes' in the town's British Legion Club. Anyone who looks hard enough around the town will find War Memorials for the First and Second World War. There is one by a roadside and some of the existing or former churches have memorials for their former parishioners. As I explain in the "People's War" story for some years some townsfolk have suggested that the Town Council had a War memorial for the whole town regardless of religion or denomination. This resulted in the dedication of the Memorial Sculpture seen in the photograph. While there are no names of the Fallen on the Memorial the Town Council had been given the names of many of those killed in wars and conflicts with links to the town. Thes Council has a list of names originating from various sources, such as the Church War memorials and letters from friends and relatives. At the request of the Town Council Chairman, over recent weeks I have been attempting to put the details into an appropriate format so that they will be remembered. By far the vast majority of deaths occurred during the two World Wars. As might be expected the list for WW1 is larger than that for WW2. So far I have a list of about 130 for WW1 while the list for WW2 so far numbers 79. As I have researched more about WW2 than other periods I found I already had information about some of those from Cleator Moor who died between 1939 and 1945. The resting places, where known, of these townsfolk range from those in one of the local churchyards to Japan. 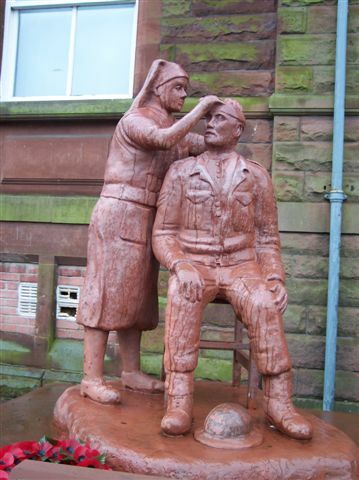 Wherever they rest, once I have completed the details of the these former citizens of Cleator Moor the council will decide how 'those who were once like us' will be displayed in the town they knew so well and was their home. This is an article which has appeared in our local newspaper – “The Agassiz and Harrison Observer” – as part of a tribute to Veterans for Remembrance Day, November 2006. Comments will be welcomed. The paper also published on the same page my BBC war series article on the “First Allied Audience with Pope Pius XII”, which might raise a few comments. In our midst here in Agassiz are many men and women who fought in the Second World War, had family that fought and died in the first and many have family who fought and died in subsequent wars, including the Korean War and the latest, the war in Afghanistan. Thomas Canning is one of those people, born July 1924 in Cowdenbeath, a small mining village in Fifeshire, Scotland and so by 1942 he was 18 and conscripted into the British Army as a recruit in primary training as an Infantryman. This lasted six weeks and so on passing various tests, he was then sent to be trained as a wireless operator in a Tank Regiment, the training consisted of learning to drive a tank – maintain it – and clean it! Firing and cleaning the guns – and the most important, learning all about the wireless and how to communicate with others in their tanks. The tanks at that time were the lighter, pursuit tanks like the Covenanter, Crusader, Valentines which were mainly being used in the desert campaigns at that time. In 1943 he found himself on a Troopship heading for an “Unknown Destination”, which after two weeks bouncing up and down in Mid Atlantic – turned out to be Algiers in North Africa. Then after a week long very slow train journey to Bone (Annaba), joined the 145th Royal Armoured Corps which was a part of the 21st Army Tank Brigade. Typically of the British Army, he had been trained on the lighter pursuit Tanks – and now had to be introduced to the 40 Ton Heavy Churchill Assault Tanks! Shortly after that they boarded another troopship landing at Naples and being welcomed to Italy by two ten year old street urchins singing Amapola and other Operatic Arias. “ We then journeyed to Lucera and were introduced to the 1st Cdn division who had had a spat with the 5th Cdn Armoured division and so Monty had fired the 5th Div and we were volunteered to support the 1st Div – all the way through Italy until they finally left in the February ’45 for the NW Europe Campaign” says Canning. Following the war Thomas found that Britain was not the same country which he had left in 1943 and so by 1957, he and his wife Veronica, emigrated to Toronto where they started their family of two boys and a girl. Their subsequent moves took them to additional locations, including Vancouver and Calgary but their path eventually ended up in Agassiz. On the anniversary date of the ending of the First World War many people still pay a silent tribute to the victims of that and other conflicts since by observing a ‘Two Minutes Silence’. At the eleventh hour on the eleventh day of the eleventh month many people cease what they are doing for a couple of minutes and reflect upon the loss of friends and family in wars and conflicts that have taken place since 1918. In almost every year since the end of the Second World War there has been at least one death of a British or Commonwealth service man or woman. On Saturday 11 November 2006, the busiest shopping day of the week, millions of people in Britain and many Commonwealth countries stopped whatever they were doing at 11.00 am and took part in the ‘Two Minutes Silence’. Many towns and villages held short formal services to coincide with the eleventh hour, including one at St Nicholas Gardens, Whitehaven, Cumbria where this photograph was taken. 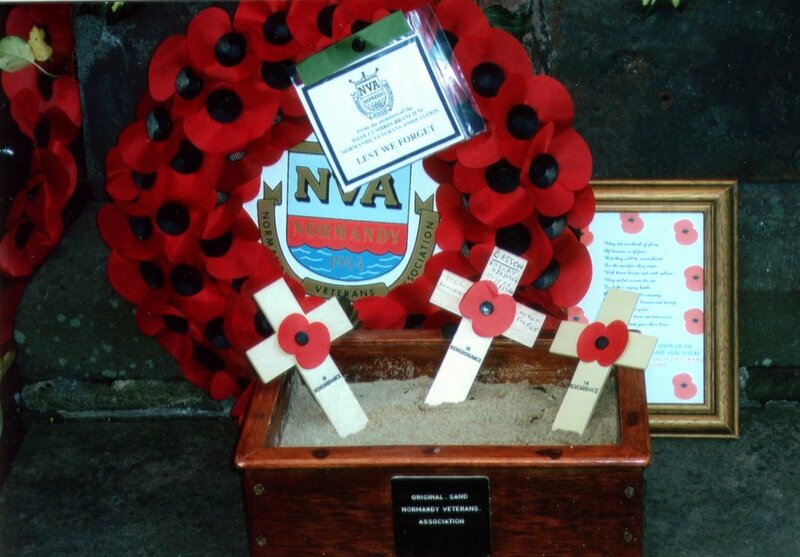 It shows some of the poppy wreaths laid by members of the public, young and old, veterans of the Armed Servives and those who have been civilians all their lives. In London, the Lord Mayor's Parade stopped for the Two Minutes Silence and the Queen dedicated a new Memorial for New Zealand Servicemen.